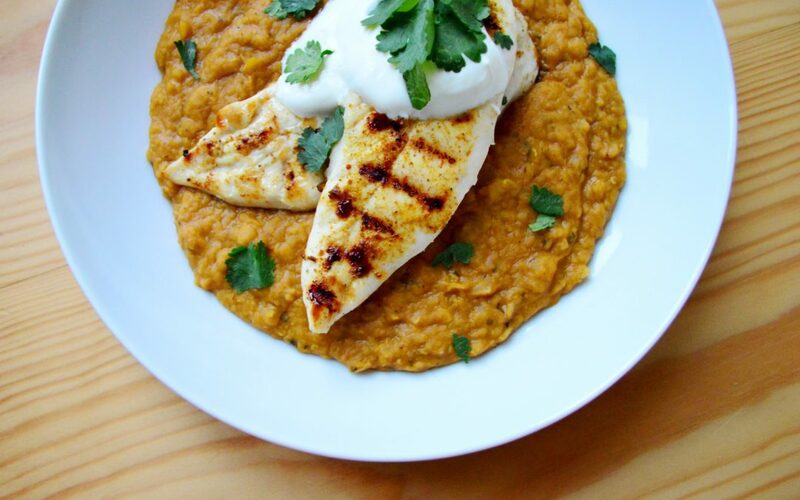 The spicy, smoky flavours of Chilli Pepper Pete’s Naga Masala make it perfect for a chicken curry, but for something a little different, try this lentil daal with marinated, chargrilled chicken on top. It’s pretty simple to put together but it tastes fabulous – serve with naan bread for dipping, or with rice for a heartier meal. 1. First, prepare the chicken. Cut the breasts into long strips, and flatten with a rolling pin or the bottom of a heavy pan to make mini-fillets about 1cm thick. To marinate, mix together 1 tbsp Chilli Pepper Pete’s Naga Masala and 3 tbsp natural yoghurt, and use to coat the chicken fillets. Set aside. 2. Finely dice the onion and garlic, and fry in a little melted butter with 1 tbsp Chilli Pepper Pete’s Naga Masala, 1 tbsp chopped fresh ginger, and half of your fresh chopped coriander (save the rest for serving). 3. Once the onions are nice and soft, add the lentils, chicken stock and tomato puree. Stir well, turn up the heat to get the sauce bubbling, and then turn it right down and put a lid on the pan. Leave to simmer for 30 minutes, stirring every now and then. 4. Brush a griddle pan with oil, and then place on a high heat and let it get really hot. Lay the marinated chicken fillets in the pan and cook for a few minutes on each side, until cooked through. If you want to get some nice chargrill lines, try not to move the fillets about too much. 5. While the chicken is frying, take the lid off the daal. Season to taste with a pinch of salt and a good splash of lime juice, add a generous dollop of natural yoghurt, and then reduce it a little until it’s really nice and thick. 6. To serve, fill shallow bowls with daal and top each one with a couple of pieces of chicken. Finish off with a dollop of natural yoghurt and a sprinkling of fresh coriander, and serve with warm naan bread. © Chilli Pepper Pete 2019 All rights reserved.